THIS PAGE INCLUDES ASTRONOMICAL PHOTOGRAPHS AND IMAGES TAKEN DURING OUR TRIP. The primary reason for this trip was to observe the total solar eclipse, which took place (from Zimbabwe) in the afternoon of Thursday, June 21. Totality occurred at 3:15 P.M. local time, and lasted for slightly over three minutes. We viewed the eclipse from the village of St. Alberts, in northern Zimbabwe located along the Zambezi Escarpment. At left is a picture of the eclipse around mid-totality. 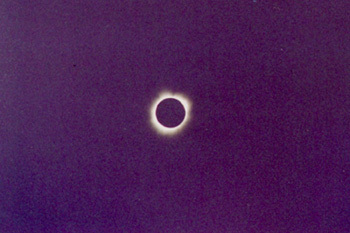 At right is a photograph taken at the moment that everyone who witnesses a total eclipse hates to see, the diamond ring that signifies the end of totality (the first bit of sunlight peeking through around the moon). Note how over-exposed this photo is, even though the corona can still be seen extending from the opposite side of the "diamond." Our primary scientific project during the eclipse was an attempt to image any comets that might be near the sun during totality, a project undertaken in collaboration with Doug Biesecker, with the SOHO project at Goddard Spaceflight Center. 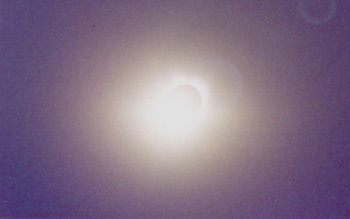 We had attempted this project -- unsuccessfully -- at the 1999 eclipse with rudimentary equipment, however for this eclipse we had use of a 20 cm (8 inch) telescope and a CCD camera. Through Doug, we were in contact with the SOHO project until just a few minutes before totality; we had hoped that there would be a report of a comet being visible with SOHO at the time, which in turn would tell us where to aim the telescope. Unfortunately, there were no such reports, so we essentially had to "shoot in the dark," i.e., take images at certain (somewhat arbitrary) locations along a hypothetical inbound cometary trajectory. Overall, we took three exposures; one of these is shown at left. 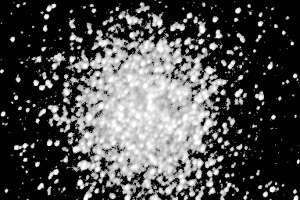 No stars are visible; the white regions are due to scattered sunlight -- the sky was still quite bright -- and the dark regions are "haloes" due to dust grains on the optical surfaces. Based on test exposures taken in bright twilight, any stars (or other objects) bright enough to be detected with SOHO should have been recorded in our exposures, however there were no stars of this brightness at the location this image, nor where any of our images, were taken. Of course, we didn't record any comets either. From that perspective, then, our project was unsuccessful, although given the lack of any comets being detected by SOHO this was not a surprise. As luck would have it, however, a comet (designated as C/2001 M6) was detected in the SOHO images approximately 11 hours after the eclipse. 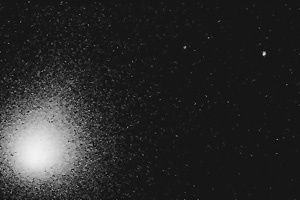 Based upon the orbit that was calculated from the SOHO data, at the time of totality the comet would have been located less than two field diameters from where the above image was taken. We were close but, as they say, no cigar . . .
Not only did we have an eclipse to observe, but one of the brightest comets in recent years was visible from the southern hemisphere during our journey. Comet LINEAR was an easy naked-eye object in the morning sky from shortly before the middle of June onwards. At left is a photograph taken from Harare on the morning of June 16; several degrees of tail can be seen. (There was a fairly bright crescent moon in the sky at the time, which made the background sky a bit bright.) 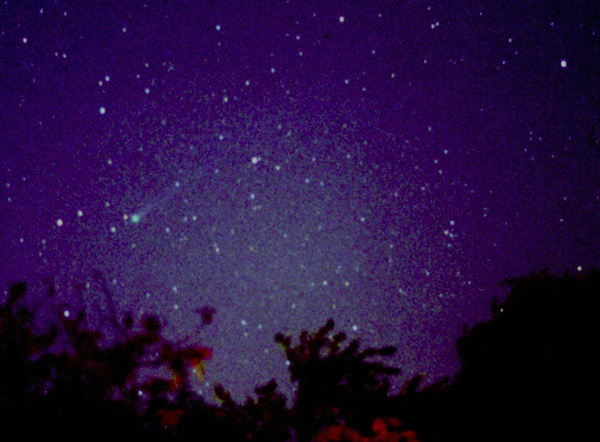 At right is a CCD image of the coma of Comet LINEAR, taken from St. Alberts on the morning of June 22. Since Zimbabwe is located in the southern hemisphere, this trip afforded an opportunity to view some objects in the southern hemisphere that aren't visible from New Mexico and similar latitudes in the northern hemisphere. Below are some CCD images of some of these objects; these were taken from St. Alberts on the night of June 21-22 (with the exception of Omega Centauri, which was taken the previous night). LEFT: the globular star cluster Omega Centauri, the best object of its kind anywhere in the sky. (Omega Centauri is actually visible from New Mexico, but only very low above the southern horizon). 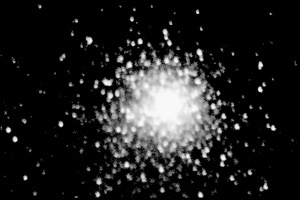 RIGHT: the globular star cluster 47 Tucanae, also one of the best such objects in the sky. 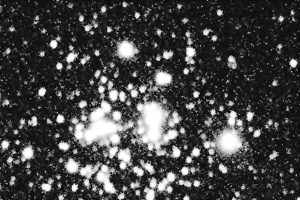 LEFT: the star cluster known as the Jewel Box, located off the eastern arm of the Southern Cross.  RIGHT: hi-resolution image of the two primary components of the Alpha Centauri system, the nearest stars to our own solar system.